For the past few months President Obama has been open to nearly any proposal to curb spending and raise the debt ceiling. There’s only one thing he’s said he categorically won’t accept: a short-term increase that kicks the can down the road and forces us to replay this entire battle next year. 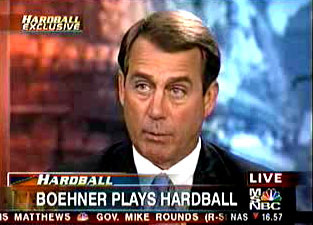 So guess what John Boehner plans to propose? Mr. Boehner planned to unveil a new debt-ceiling plan later Monday, a spokesman said. Mr. Boehner’s plan would cut the budget deficit by $1.2 trillion over 10 years and raise the debt ceiling in two phases—one that would enable the government to cover its bills through the end of the year and a second in January 2012 depending on recommendations from a congressional commission. Is there any doubt left about what Republican goals are at this point? Boehner has rejected every possible compromise offered to him, and now plans to unilaterally hold a vote on the one thing — the only thing — that he knows Obama won’t accept. This is all he cares about. He doesn’t want to solve a problem, he just desperately wants to figure out some way to get Obama to say no so that he can make some political hay out of it. Seriously, how much more obvious can he be? Is there anyone left in Washington who doesn’t get this?